Calling all runners out there, this is one fun run you shouldn’t miss even just for its nature and purpose alone. To raise child rights advocacy spirit among its partner communities- academe, young people, adult, social development, churches, parents in a creative and fun event. To encourage greater public awareness and social investment on children- where every child could fully develop and participate in putting place an environment that respect and celebrate their full potential. The Movement for the Youth’s Legal Education (MYLE) is an organization in the UP College of Law that seeks to provide legal education primarily for children, and secondarily for the children’s families and their educators towards a holistic formation of the Filipino youth. It aims to provide awareness to children of their basic rights through classroom activities, lectures and workshops. MYLE also seeks to serve as a venue for students of the law to engage in a pro-active approach to learning laws pertaining to children’s rights. Lingap Pangkabataan Inc. is one of the social development organizations in the Philippines whose primary mission is to lead in child- advocacy efforts. As an organization or a network member, Lingap has been at the forefront of community education, awareness- raising, lobbying and other advocacy activities upholding the rights of children and promoting child protection. 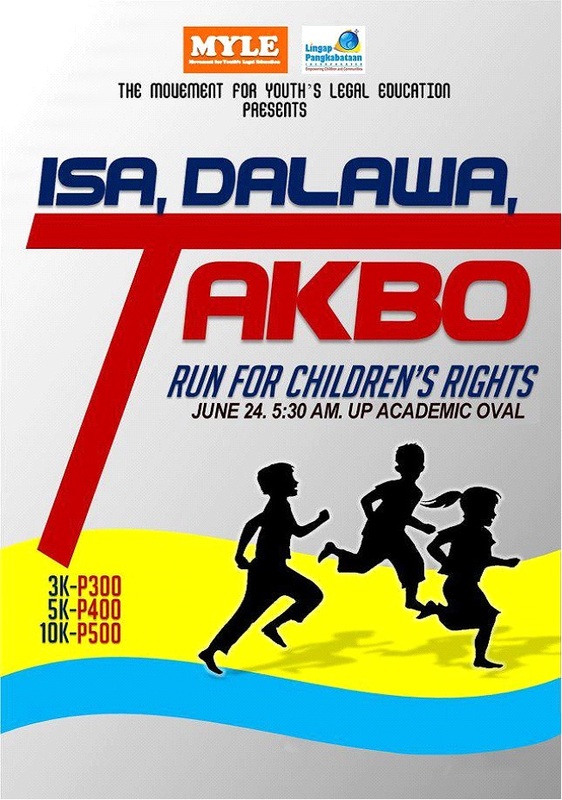 Isa, Dalawa, Takbo: Run for Children’s Rights is open to all child rights advocates/ supporters and fun run enthusiasts. Submit duly accomplished registration form and pay required registration fee. The Pre- Registration Volunteer will facilitate registration process by enlisting the participant in the pre- numbered SUMMARY LISTING according to category and assigning a runner’s number. FUN RUN KITS (singlet, runner’s number, baller and other freebies) will be made available two weeks before the event. Registered participants can claim the kit at their PRE- REGISTRATION STATION by presenting their Fun Run Kit Stub. The ‘Fun Run Kit Stub’ will serve as the receipt of the participants. Deposit slips should be emailed to takbo_lingap@yahoo.com.ph or faxed to 912-4225 together with the duly accomplished pre-registration form. Lingap will then send the FUN RUN KIT STUB with the registration number thru email. Great informations on Children’s Rights. Thanks for post! Well written post. Thanks for sharing with us. Keep it up.